A few of us in the Peninsula store like to take short one-night bike tours, or Sub 24-Hour Overnights, throughout the year. 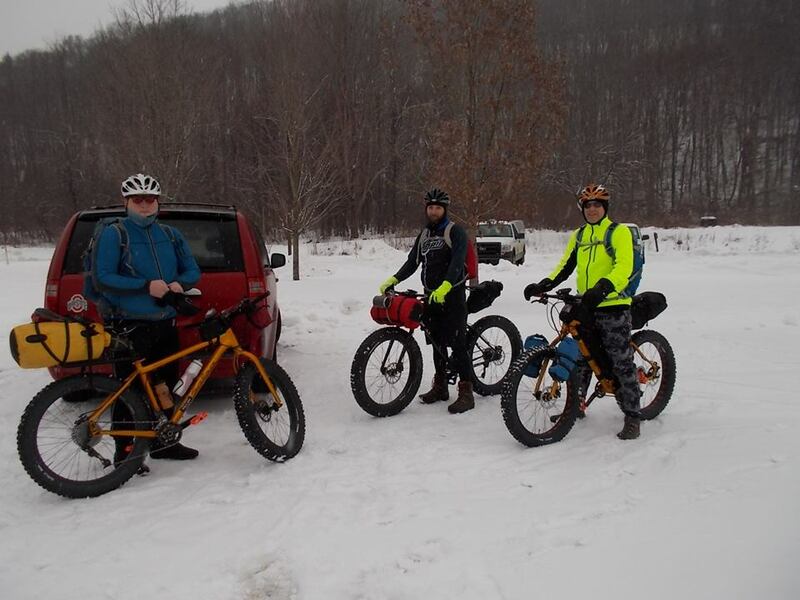 With snow bike season in full swing, we figured why not take a snow bike tour? Chris got the bright idea to drive out to Oil Creek State Park, near Oil City, Pennsylvania. The park has a bike path that runs along the creek, which we could ride on fat bikes until we got to a hiking trail that leads to the top of the ridge overlooking the creek. Up the ridge is a set of lean-to shelters for overnight camping. Then, we’d ride back to the car the next morning. So what does one pack for a bike-camping trip in the winter time? It’s pretty much the same as bike-camping any other time, except you take some warmer clothes. We could save a little packing space by not taking tents, since we’d be sleeping in a shelter. A 5-second time-lapse video of riding my Salsa Mukluk 2 fat bike in the snow at the Bedford Singletrack in the Cleveland Metroparks Bedford Reservation. Only about 3 miles of riding, on the Parallel Universe 1 Trail, last section of the Friendship Trail, Moore Trail, and Volunteer Spirit Trail.